For what they have done, they must pay the ultimate price! The Ultimate Marvel universe, originally created to appeal to new readers without fear of years of Back Story or Retcon, had begun to stagnate after a decade from its creation. Some series, such as Ultimate X-Men and Ultimate Fantastic Four, had fallen into Seasonal Rot. Marvel tried to change that with a big Crisis Crossover, written by Jeph Loeb. It would be followed by a complete relaunch of the Ultimate line, with new #1 issues. The earlier arc Ultimates 3 killed the sons of Magneto, Quicksilver and the Scarlet Witch, and left Magneto wanting revenge. For this, he altered the earth's axis with his powers, which caused natural disasters around the world. A flash flood reaches New York, and many heroes are killed by it. Some members of the Brotherhood of Mutants wreak havoc among the survivors, and Magneto kills Charles Xavier himself. The surviving heroes eventually band together and follow Magneto to his floating fortress. After another fight, Magneto is finally killed. Many characters, both heroes and villains, died in the story; either during the flash flood or the subsequent fights. The series, however, was not followed by a relaunch as initially planned. 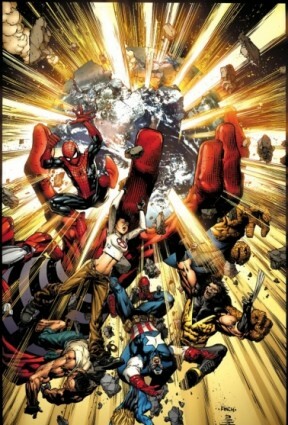 The ongoing titles were rearranged (Ultimate Fantastic Four and X-Men closed, and new titles were released: Ultimate X, Ultimate Avengers, New Ultimates, etc), but Ultimatum was still canon and the books were set in the aftermath of the destructive flood. Always Save the Girl: Subverted in the Fantastic Four section. Reed prioritizes stopping Doom over saving Sue, leaving Ben to help her. She is not happy once she's better. And This Is for...: Thor started his attack on the legions of the undead crying "For Valkyrie!" Anyone Can Die: And we mean ANYONE. Although it turned out that Death Is Cheap in a handful of cases, most of the characters that died in this miniseries were permanently put down for the count. Here's a full list of deaths. The list includes all the sacred cows of the X-Men: Xavier, Magneto, Wolverine and Cyclops. Artistic License  Law: In the aftermath, the U.S. government creates and passes a law rendering just being a Mutant illegal, to the extent anyone found being a mutant is arrested without trial. In other words, a bill of attainder, which are meant to be forbidden. Artistic License  Physics: Reed gives two explanations for how Magneto caused the tidal wave. Either he reversed the earth's magnetic poles (which wouldn't have much effect) or he reversed the axis (which he would have no power to do). Some have speculated that he could have caused the tectonic shifts necessary to create a tidal wave by moving large metal reserves in the earth's crust, but this is never stated in the story. As the Good Book Says...: Magneto compares his action with the great flood, and quotes passages of the Bible to that effect. As You Know: The second issue starts with Spider-Man making a recap of the previous one. Avengers, Assemble! : The story starts with each of the Fantastic Four, Stark and Captain America, Wasp, Pym and Hawkeye, Thor and Valkyrie, Peter Parker and his gang, and part of the X-Men all having a free day and minding their own business. Then, New York is flooded. Back for the Finale: If this was the end of the Ultimate universe, as originally planned, Nick Fury would have fitted the role. Bad Guys Do the Dirty Work: Reed is fully aware of the things that Van Damme did, including his part in all this, but his moral code does not allow him to kill him. So he blames himself that he's partially responsible, because his unwillingness to kill caused all this. He confided all this with Ben, who then took it to himself to do what Reed did not dare to do, and kill Van Damme. Bait-and-Switch: If Hela allows Valkyrie to leave the land of the dead, someone has to stay in her place. Captain America tells Thor that he will stay: as far as they know, he's dead, how else can he be there? The focus moves to other parts of the plot, and we get the idea that he's the one who stays. But no: it was Thor who stayed. Blade Reflection: Issue #5 starts with Wolverine ready to attack, and Magneto's face is reflected on his claws. Bland-Name Product: The X-Men pass near a cinema with the image of a lion and a film named "The Loon King"
Bloodier and Gorier: The series features dismemberment, people visibly exploding on panel, and in the Signature Scene, the Blob visibly eating the Wasp and Yellowjacket responding by biting the Blob's head off. Bond One-Liner: "Glory that, you multiple jackass"
Xavier is alone in the mansion, with Magneto. A crippled man against a man with powers that rocked the whole planet. Nobody will come to help him, as in the White House. Nobody is keeping Magneto powerless, as in the Triskelion's cell. And still, Xavier remains Defiant to the End. What happens next is no surprise. Dr. Strange thought that he could defeat Dormammu all by himself (remember that Ultimate Dr. Strange is not the "Sorcerer Supreme", but just a TV celebrity who knows a pair of spells and that's it). Again, what happens next is no surprise. Xavier is well aware that he's saying something obvious, but he says it anyway, as it does not seem so obvious to Magneto: he's not God. Pym tells the Wasp that everything is OK, that she's going to be fine. Hawkeye pointed: "She's not OK. She's dead." The Cavalry Arrives Late: Sue Storm and the Thing show up to fight Dormammu, right after he killed Dr. Strange. Colony Drop: After killing Magneto, the heroes blew up his floating fortress, which fell to the ocean below. Hulk mentioned that he broke Wolverine in half. He did so at the Ultimate Wolverine vs. Hulk mini. The scene where Fury shares with Magneto his knowledge about the mutants' true origin has glimpses of the scenes from Ultimate Origins. Crisis Crossover: The first major one for the entire Ultimate Marvel line. Dedication: At the end of the comic it reads "Dedicated to Brian, Mark, Bill J. and Joe Q who started it all"
Defiant to the End: Wolverine had been reduced to a pulp by Magneto, but he was not dead yet. He has just a skeleton and some pieces of meat, and yet he was still alive, and managed to land his claw on Magneto, giving him a serious injury. Did You Just Flip Off Cthulhu? : What can Nick Fury, a mere man, do against the nigh all-powerful Magneto, who had just rocked the planet with his powers? Share his knowledge about Mutants' true origin with a mental link from Jean Grey. This caused him to have a Villainous BSoD. Angel rescued Alison, but she had drown, and died in his arms Cue a Big "NO! ", and a Little "No". Thor had the corpse of Valkyrie in his hands, but refused to accept his death. So he went to Hela's domain to reclaim her life. Spider-Man dies in the story, but it was later revealed that he was Not Quite Dead. Disproportionate Retribution: The reason why Magneto caused the apocalypse was to get back at the Ultimates for the deaths of his children. Bit of an overreaction there, dude. It should further be noted that he was horribly, horribly abusive to said children, to the point of crippling his son at one point just for siding against him, further adding to his hypocrisy. Do Not Adjust Your Set: Xavier gave a global warning with his powers, telling everyone everywhere that the flood had been caused by Magneto, and where is his secret base. Downer Ending: Various heroes are dead, the X-Men (what's left of them) and Fantastic Four disband, Quicksilver is working for a mysterious evil individual, and Mutants are even more discriminated against than they previously were. Drama-Preserving Handicap: Jean had resurrected Angel a short time ago, after the battle with Apocalypse. She can't do this again and bring back anyone, because she has lost the Phoenix powers. Dramatic Drop: When the Ultimatum wave hits New York, Reed drops the ring that he was about to use to propose marriage to Sue. Dropped a Bridge on Him: Just about everyone who dies. First-Name Basis: Charles always spoke with Erik in those terms, even when they were bitter enemies. So when he drops it and calls him "Magneto", it's clear that their friendship is over. Magneto understood it clearly. Gilligan Cut: Cyclops warns people that, if the law is sanctioned, mutants will be haunted and shot on sight. Right then and there, he's shot. The Gloves Come Off: The heroes are more than willing to KILL Magneto for this. Wolverine made it clear at the start of issue #5. A God Am I: Magneto always had dellusions of grandeur, but this time he has gone too far, comparing his action with the biblical great flood. Xavier had to point it: Magneto is not God. If you had been reading Ultimate X-Men since day 1, it should be abundantly clear that Magneto is absolutely not being out of character here. This kind of mass genocide had always been his goal; the only difference here is that the X-Men could not stop him in time this time. So, when you find Sabretooth and Juggernaut drowning their sorrows in the last X-Men issues because they had never signed for genocide, it's clear that they had been hit with this trope. Dr. Doom manipulated Magneto to declare war on mankind. And it worked. It worked too well. Gorn: The comic is infamous for this: Blob devouring Wasp's ripped guts, Hank Pym getting blown up by suicide bomber Multiple Man, complete with flying guts and a skeleton being incinerated, Doctor Strange getting squeezed by his own cape until his head graphically explodes, etc. Guns in Church: Why does Carol Danvers need to carry a BFG around in the Triskelion? He Who Must Not Be Seen: There is a woman in the shadows in the last page, that seems to be allied with Quicksilver in the creation of a new Brotherhood of Mutants. Sabretooth started a villain, and in the X-Men tie-in he joined the Alpha Flight against Magneto, and then left that team and joined Magneto during a fight. Multiple man has his mind distributed on so many duplicate bodies, that he's basically losing himself, and his duplicates gradually start to think by themselves. This is fully explored in the X-Men tie-in, but it also appears in the main story, as some duplicates tried to blow up the Triskelion for Magneto, and another duplicate (neither of them the "main" Multiple man, whose original is elsewhere) tried to kill Magneto because mutants also died in the flood. Heroic Lineage: Dr. Strange had one. Not having sons, Dormammu ended it. Heroic Sacrifice: Yellowjacket gathers the Madrox dupes suicide bombing the Triskellion and takes them out to sea to save the rest of the Ultimates. The only way to get rid of the never ending waves of duplicates of the Multiple man is by killing the original one. Wolverine had to hunt the original Madrox all across the world. Captain America mentioned in Valhalla that for each zombie they killed, two others take its place. I Warned You: Nick Fury warned the heroes, back in Ultimate Power, that if they left him out, terrible things would happen. And they happened indeed. He does not miss the chance to remind them of this. If I Wanted You Dead...: If Nick Fury wanted Doom dead, he would be dead already. I'm a Humanitarian: When Hawkeye finds Wasp's body, it's had a chunk bitten out of it by The Blob, who comments that it "tastes like chicken". Infant Immortality: Notably, the mostly teenage cast of Ultimate Spider-Man survives untouched, as do the youngest members of the X-Men and all of the Fantastic Four. Inherited Illiteracy Title: One of the banners of the anti-mutant mob says "Sentinals [sic] are the answer"
Is This a Joke? : Ben is simply using the bench press in his free time, and suddenly a sea wave hits the whole building, dropping a whale on him. Just Here for Godzilla: In-universe, the Human Torch attended the demonstration at the Congress because he understood that it would be fun. But Kitty never said it would be fun: she said it would be important, which is not the same. Killed Off for Real: See directly below. But more specifically, Professor X, Wolverine, and Magneto are gone, among many other really big names. Killed Offscreen: The Academy of Tomorrow (Emma Frost, Sunspot, Cannoball, Polaris) and Longshot, Forge, Detonator and Hardrive were all listed as dead at the start of issue 3. Kill 'em All: No kidding. In the first issue it is unclear who started the disaster. Magneto is revealed by the end. Nowadays, that's common knowledge. The first reaction of Pym and Hawkeye after the flood is to search for the Wasp, who was with them before it. For a brief moment it seems that Hawkeye found her, but when we turn the page, the Blob is eating her corpse. That scene became the Signature Scene of the whole comic, more than the covers, and modern readers should have seen it coming. Everyone's reaction when the sky suddenly got dark and the ultimatum wave hits New York. Also, when Magneto killed Wolverine. The statue of Liberty is still standing, but completely damaged. The British Parliament was attacked by Multiple Man's bombers. Mood Whiplash: We go from the truly awesome moment of Cap and Thor fighting the hordes of the undead to the nauseating scene of the Blob cannibalizing the Wasp. My God, What Have I Done? : Magneto has this after learning the truth about mutants who in this universe are a result of genetic experimentation, leads to a brief Villainous Breakdown before Cyclops kills him with an optic blast. Neck Snap: How Magneto kills Professor X. Never Found the Body: There was a flash of magic light, and Spider-Man was no longer there. Only his mask remained. Kitty was not sure if that meant he was dead or not (he wasn't). Never Trust a Title: At no point in the comic does anyone actually issue an ultimatum. Nice Day, Deadly Night: Spider-Man complains that this kind of stuff always happens at night. Nice Job Breaking It, Hero! : Hulk smashes things at the ruins of Dr. Strage's house, and Dormammu got released as a result. Not Me This Time: Reed Richards is sure that Namor caused the flood, even after the global warning sent by Xavier. Nothing Personal: Blob tried to use his defense when Pym, enraged, asked him why did he eat the Wasp. As you may suspect, it did not end well. Off with His Head! : Blob had his head cut. Magneto, Dr. Strange and Syndicate had their heads blown off. Open Secret: When Nick Fury discovered the lab that created mutants, everyone was Killed to Uphold the Masquerade. Only Fury knew it and kept it secret, because The World Is Not Ready. He shared this knowledge with Magneto, to cause his downfall. But by doing this, those who were also there also learned the truth: Jean Grey, Reed Richards, Van Damme, Arcanna, Cyclops, Hawkeye, etc. Plot Hole: How does Captain America, a human, appear in Hel? Neither Thor nor Cap know why, and the issue remains unanswered. Pun-Based Title: Except it doesn't quite work since no ultimatum is ever issued at any point in the story. Power Incontinence: Sue is in a coma, and she's suddenly turning everything invisible. Wolverine's; first almost all his soft tissue is blasted away, then his skeleton is torn apart, then the individual cells of his last remaining bones are destroyed. Magneto, as well. His hand is cut off by Valkyrie, Wolverine goes to town on him, and finally Cyclops disintegrates his head. Refused by the Call: Wolverine does not want Kitty or Bobby coming with them to the fight against Magneto. Things are going to get ugly. Rocks Fall, Everyone Dies: Could be the comic codifier. With the amount of ridiculous deaths, it starts to seem like someone at Marvel was using this as some sort of catharsis. note The most obvious candidate being Jeph Loeb, who was suffering from grief after the death of his son. Saw "Star Wars" 27 Times: Kong, the boyfriend of Kitty, has seen The Dark Knight eigth times, and he's willing for the ninth. After the wave hits, Pym becomes giant and cries "Jan", while desperately looking for the Wasp. Sue collapses under the strain of forcing all the water back into the ocean. Reed then cries her name. Selective Magnetism: Magneto is seen somehow treating a bleeding wound using magnetism. Probably the best explanation (in that it wouldn't work, but sounds almost possible if you don't know) is that he's controlling the iron in blood. After Dr. Strange's death, someone shows up, takes his corpse and dissapears in a flash of light. But we never got to know who was that, or what happened to the corpse. When the story ends, Quicksilver is starting a new Brotherhood, with Mystique, Sabretooth, and a mistery woman in the shadows. In the first issue, before the flood, it's a shiny day. In the second issue, Spider-Man is complaining that those things always happen at night. Hela rules in Hel, not Valhalla. Shoot the Dog: At the end, after hearing Reed talk about how much of a threat Dr. Doom is, Ben quietly goes to Latveria, kills Doom, and leaves. Shout-Out: Peter Parker and his gang have seen The Dark Knight, many times. Take Me Instead: Thor told Hela to keep him in the land of the dead, allowing Valkyrie to come back to life. Tastes Like Chicken: The Blob says this exact line when he's eating the Wasp. Team Killer: For some odd reason, Longshot, Forge, Detonator and Hard-Drive are among Magneto's victims despite being Brotherhood members. It can't even be excused as accidentally casualties in the wide-scale destruction as Mystique mentions having them captured and tortured in the Savage Land. Page 1. The Thing is using the bench press, and asks a robot "What's gonna happen?" Gwen is troubled by all the weird things that she had been through recently. Kitty tried to confort her and said "it's like it could get any worse, right?" This Is Unforgivable! : Magneto was always perceived as a monster, but when even Charles says this, it's clear that he's completely beyond forgiveness or redemption. He was sorry when he learned the truth, but as Cyclops pointed, his actions were far beyond the forgiving point. Time Skip: The heroes leave Magneto's fortress, after killing him. Eight days later, there is a riot next to the Congress, which is about to ban all mutants. Title Requiem: Ultimatum was followed by "Requiem" issues of X-Men, Spider-Man and Fantastic Four. Torches and Pitchforks: There was an angry mob at the Congress, filled with hate against mutants, while the Congress was about to ban them. The Undead: Thor had to fight a whole legion. The Un-Favourite: Johnny Storm does not like it that his father is constantly comparing him with Sue. And always placing him as the worst side of the comparison. Unusually Uninteresting Sight: Kitty phases Peter through the train's roof and convinces him to change clothes into Spider-Man right there. He complains that anyone can see him, but she point that surely nobody will care about that at that moment. Villain Has a Point: Reed is sure that Namor caused the flood. He didn't. He pointed that would have never had done anything that may endanger Sue. Reed could not counter his point, but attacked him anyway. Villain of Another Story: In the main story, the destruction of Dr. Strange's sancta sanctorum leads to Dormammu being released. He kills Dr. Strange... and is never mentioned again. His rampage and eventual defeat are detailed in the FF tie-in. Villainous BSoD: Fury revealed the truth about mutants to Magneto, causing this reaction. Villainous Rescue: Spider-Man needs some help, and he's helped by... Hulk. Oh, Crap! Wedding Smashers: Perhaps that's the least of his concerns, but Magneto's attack completely ruined Reed's marriage proposal to Sue. Wham Episode: The entire exercise of the series was to shift everything around so much that the status quo could never return. Hawkeye gets a damn justified one on Captain America when he makes a snarky comment about Hank Pym's Heroic Sacrifice. Before everything started, he also reminded Jan about the horrible things that Pym did to her. What the hell is she doing, talking to him? Who dares cause a flash-freezing in Latveria? Who dares to get into the Castle and insult Van Damme? Yeah, Ben dares. The Worf Effect: Longshot had quite a reputation of avoiding death by those Mojo's mercenaries. He had only been defeated by the Scarlet Witch, who also had powers of probability to counter his. And yet, he is simply Killed Offscreen. You Didn't Ask: Hawkeye has an enhanced vision. How else did you thought he made all the bulleyes? Practice? Your Head A-Splode: Dr. Strange's death.